The Festival of Jerez ignites this laid-back Andalucian city every February and March with its incredible flamenco festival. Jerez de la Frontera is a thriving center of flamenco. Its storied local performers cram the theaters which inspires the artists on stage to give it everything they’ve got. Walk through the streets and you’ll hear palmas (clapping) , guitars and the rhythm of footwork from practice studios. Here is the best place in Spain to see flamenco performances by top dancers, singers and guitarists. Ole! Jerez de la Frontera is of course, equally famous for its production of sherry. I personally can’t imagine anything better than tasting sherry during the day and watching flamenco shows in the evening. Situated inland, Jerez produces heartier sherries with less brininess compared with those made on the coast. Sherries made in the seaside towns of El Puerto de Santa Maria and Sanlucar de Barremeda have a lighter, more delicate flavor. We received two new sherries from Jerez this week. I suggest you stop in at The Spanish Table to pick up a bottle of sherry, then go to You Tube to enjoy the latest performances from Jerez de la Frontera. J.C. Gutiérrez Colosia Elcano Fino, El Puerto ($11.99/375 ml) Produced in El Puerto de Santa Maria from the Palomino grape and aged under a layer of yeast called flor, Elcano exhibits a rich, fresh nose with notes of bread, green olive and nutty hints. This is dry, but not bone dry. Dios Baco Amontillado, Jerez ($21.99/750 ml) is initally aged under flor like a fino. After about 4 years the flor dies off and the wine continues to age in the barrel,resulting in more richness and complexity. Dios Baco is a small producer located in the heart of Jerez. Their amontillado is without a doubt one of the best values in Jerez and one of our top selling sherries. Silky, palate coating flavors of toasted nuts, orange zest, a touch of caramel and just a tiny touch of sweetness. Bodegas El Maestro Oloroso, Jerez ($15.99/375 ml) Olorosos are more heavily fortified and aged without the use of flor. Maestro Sierra Oloroso is dark amber with intense flavors of roasted walnuts, butterscotch and figs. Rich on the front palate, it finishes dry. Lustau East India Solera, Jerez ($12.99/375 ml; $24.99/750ml) This is my pick for a sweet dessert sherry. A blend of Oloroso with PX, it has an average age of 14 years aging. Made in the style of the sherries that used to sail around the horn of Africa to the troops in India, it has hints of vanilla, dried fig and mocha. Lingering notes of crème caramel, orange and loads of Asian spice. Velvety, with a lingering finish, it is hard to stop at one glass. A.R. Valdespino El Candado PX, Jerez ($22.99/375 ml) PX sherries are made from Pedro Ximenez grapes that have been dried in the sun for two weeks after harvest. “El Candado” means “the padlock” and indeed this sherry is so ambrosial that it comes with a padlock and key to deter one from drinking it all in one sitting! Fantastic nose filled with aromas of toffee, molasses, spice and brandied ripe raisins. The palate is a viscous treasure with its rich luscious texture and unctuous consistency. Mouthfilling flavours of spice, honey, toffee and dried fruit fill the mouth. Incredible length and perfect harmony with a clean finish and exceptionally long aftertaste of treacle, caramel, honey and raisins. The sweet tanginess of Piquillo peppers enhance the richness of the Dungeness crab, and the sherry adds sinfully Spanish aromas. The peppers are as red as hearts pulsing love! Make a white sauce by melting 1 tablespoon of butter. Cook the flour in it until it begins to sizzle, then add the milk and whisk until thickened. Divide the white sauce into two equal portions. Filling: Whisk sherry into half of the white sauce over low heat until fully incorporated. Remove from heat and fold in the crab. Let cool while you make the sauce. Sauce:Combine the remaining white sauce with the wine, heat and then whisk in the ground almonds and half the parsley. Assembly: Holding the Piquillo peppers suspended between your thumb and forefinger, spoon the stuffing into them. Place the peppers in a 10 inch cazuela, the points toward the center so they form a “rose.” Spoon sauce over stuffed peppers and heat in 350º oven until peppers are hot to center (20 minutes). Sprinkle reserved minced parsley across the top. 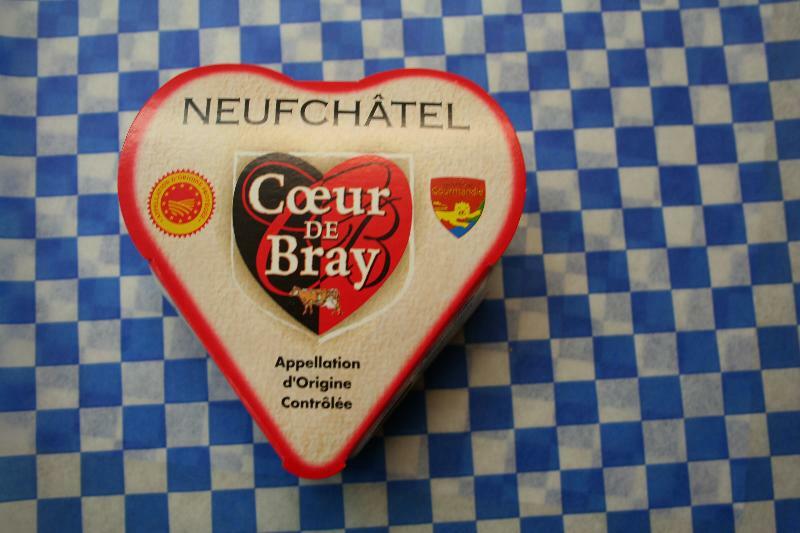 Coeur du Bray (pictured above): According to legend, the young maidens of Neufchâtel-en-Bray offered this cheese to their gallant English conquerors during the wars in the Middle Ages. This heart-shaped, brie-style cheese will win you over with its creamy texture and mild yet earthy flavor. Gres des Vosges: Alsace is full of beautiful cherry trees from which the farmers make their own local kirsch. Each oval of this cow’s milk cheese is washed with this subtle cherry brandy, which lends a fruity aroma. Slightly salty flavors and a luscious texture make this a favorite! 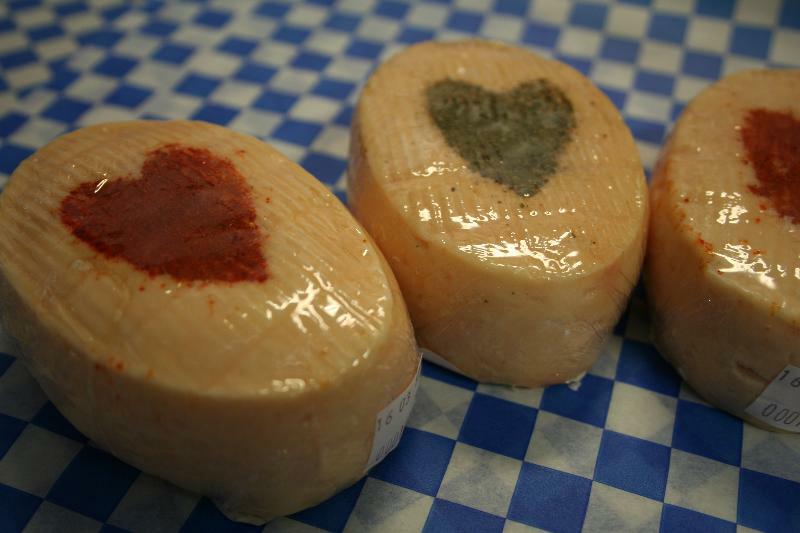 Each cheese is decorated with either herbs or paprika in the shape of a heart. This very morning, we received two huge shipments of jams, mustards, salts, and other goodies! More on the new favorites next week, or you can check out our Facebook page for the latest updates and ideas. Celebrate with a sparkling wine! Lucien Albrecht Crémant d’Alsace Blanc de Blanc ($19.99) Domaine Lucien Albrecht is one of the oldest and leading Alsace family owned estate, tracing its roots back to 1425. The hand picked fruit for the Blanc de Blanc is produced by “méthode traditionnelle”, which is the true Champagne method. Made from 100% from Pinot Blanc, it is distinguished by a fine bead, a beautiful straw color; and a light, delicate palate. This elegant cremant is delicious with soft goat cheeses. NV Torre Oria Brut Nature Cava ($16.99) Most cavas are produced in Penedes, just south of Barcelona but Torre Oria hails from Utiel-Requena, a very hot region just inland from Valencia. A blend of 90% Macabeo and 10% Parellada, it is aged 36 months on the lees and is the driest style of cava. Pale golden, bright, it has very fine and abundant bubbles. Magnificent presence on the palate, very dry, powerful and leaving a lingering aftertaste. Elegant. 2005 Marques de Gelida Brut Exclusive Reserva ($14.99) Vins El Ceps S.L. is a partnership of four families who have been cultivting grapes and making wine since the 15th Century. To produce Marques de Gelida, grapes are selected from the best estate-owned vineyards. A blend of Macabeo, Xarel.lo, Parellada and Chardonnay, the Brut Exclusive has been aged for 36 months on the lees, which gives a creamy edge to the fruity and citrus flavors. Just off bone dry, it is clean and fresh, with excellent balance and a long, delicate finish. 2007 Augusti Torello Mata Rosat ($24.99) Agusti Mata is the maker of cult-cava Kripta, and he is one of the few to still producer a Rosé cava from the traditional Trepat grape. Fine and persistent bubbles form a consistent rosary and dense crown. Aromas of wild strawberry and cherry have a background of mint. On the palate, it is complex and meaty, yet light and very, very dry. It is well balanced and has a pleasant, well-harmonized medium intensity finish that brings back the aromas of fresh mint. NV Cavas Hill Brut de Brut Reserva ($9.99) A delicious budget sparkler, Cavas Hill is made in the traditional method, with fermentation in the bottle and ageing on the lees for 20 months. It’s loaded with clean and crisp pear aromas and fine, delicate bubbles. Green apple flavors provide freshness and the persistent finish ends on a satisfying dry note. Great with seafood! 2001 Bacalhôa Moscatel de Setúbal ($15.99) This spectacular dessert wine really over delivers! Made of 100% Moscatel de Setúbal, the grapes are fortified with brandy, macerated on skins for 5 to 6 months, then aged for a minimum of three years in small used oak barrels. A rich dessert wine with plenty of lift, it has aromas of orange tree flower, tea, nutmeg and raisins. Smooth, sweet and fresh, it has a persistent finish that will keep your lips smacking. Serve this with chocolate covered figs! 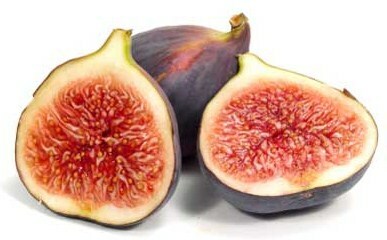 Rabitos (chocolate covered figs) are back in stock! We have individually wrapped pieces, 3 piece boxes, 9 piece and 16 piece boxes. Give these to your special chocolate lover for St. Valentines Day! Celebrate and taste these historic wines at a winemaker dinner on Friday, February 26th at Andaluca Restaurant in Seattle. Established in 1879, Compañia Vinicola del Norte de España (CUNE) is one of the best selling producers of Rioja. Join David Tindall of Pasternak Wine Importers at Andaluca Restaurant for a five course dinner, featuring the wines of Cune and Viña Real. Chef Wayne Johnson has created a fantastic menu to compliment each wine. Click the link for details. Shop from home on The Spanish Table’s websites! The Spanish Table wine website has everything you’re looking for from Spain, Portugal, Madeira, or South America. Orders are shipped from our Berkeley CA store which may have different inventory and prices than our Seattle store. For products other than wine, click on The Spanish Table to purchase food, books, cookware and other products.